US officials deny deal with Russia on missile shield. Officials from the US Department of Defense have denied persistent rumors that Washington’s decision to scrap the controversial missile defense shield was part of a secret deal with Moscow. They also continue to insist that “[t]his is not about Russia. It never has been about Russia”, according to US defense undersecretary Michele Flournoy. US DHS is hiring cyber experts. The Obama Administration has approved a request by the US Department of Homeland Security to hire of up to 1,000 cyber experts over the next three years. The recruits will include “cyber analysts, developers and engineers”. One hopes the move will also patch the countless holes in the Department’s cyber defense posture, which were revealed last month in an internal report, to little media attention. MI6 is also hiring. Britain’s Secret Intelligence Service –also known as MI6– is hiring and has uploaded a snap test (called “selection tool”) on its website to test whether those interested have what it takes to be a spy. The test, which evaluates how well potential candidates can lie, is located here. Get ready for body cavity airport searches! Security officials are concerned over a tactic newly employed by al Qaeda, whereby suicide bombers store explosives inside their bodies to avoid detection. Did the US do a deal with Russia on Iran? Two weeks ago, Russian President Dmitry Medvedev hinted that Russia could back tougher sanctions against Iran’s nuclear energy program. Does this signify a deal with Washington, namely US scrapping its missile shield program if Moscow would back efforts to impose tougher sanctions against Iran? Lebanese mayor accused of spying for Israel. Lebanese authorities say Ziad Homsi, mayor of the city of Saadnayel, was recruited by Israeli intelligence in Beijing, China. Lebanon’s immense counterintelligence operation is widening by the hour. US intelligence caused change in missile shield plans, says Gates. US Defense Secretary Robert Gates said that the Obama administration’s decision to abandon the previous administration’s plans for a land-based missile defense system in Eastern Europe came about because of a change of the alleged threat posed by Iran in US intelligence reports. But he also said that the Bush administration plans will not be scrapped. The land-based missiles in Poland and the Czech Republic will be replaced by missile interceptors aboard US naval ships. Canada preparing big balloon (?) to spy on Taliban. The Canadian armed forces are testing a large white balloon equipped with an on-board spy camera, which will be used in Afghanistan to detect improvised explosive devices. Depending on the exact camera used, the system could have a surveillance range of five to twenty kilometers. Portugal’s secret services deny spying on president. Portugal’s SIS secret service agency was forced to issue a rare public statement last week, denying having spied on the country’s president, Anibal Cavaco Silva, of the Social Democratic Party, just 10 days before a closely-fought parliamentary election. Silva is Portugal’s first right-wing head of state since the end of the dictatorship in April 1974. So, was it pirates or Israeli spies that intercepted a ship carrying Russian missiles? Several observers are beginning to think that Israeli intelligence intercepted or was otherwise involved in the interception of the Arctic Sea, a Russian ship that reportedly carried Russian missiles destined for either Iran or Hezbollah. Trial of accused Palestinian spy begins in Israel. Rawi Sultani is accused of having informed Hezbollah of his membership in the same fitness club as the head of Israel’s military forces, Lieutenant-General Gabi Ashkenazi, in the town of Kfar Saba, as well methods of access into the club. Sultani says that the whole case is nonsense and that he doesn’t even know what Ashkenazi looks like. Czech spies see Russians behind antiwar group’s actions. The Czech Security Information Service (BIS) is monitoring a billboard agency, which has given free advertising space to an antiwar group opposing the country’s participation in US missile defense shield plans. The US announced on Thursday that it plans to abandon the plans. Newspaper Aktuálně reported that BIS suspects Russian involvement. People in the Czech Republic are incapable of opposing US missile shield plans without Russian prompting, it appears. How the ACLU got the CIA agents’ photos. As intelNews reported earlier this week, the ACLU has been trying to identify CIA agents who participated in torture of detainees, by taking surreptitious pictures outside the operatives’ homes. It is worth noting that uncovering the identities of CIA officers is legal, so long as it is based on publicly available records. Russian espionage case is bigger than initially thought, say Czech officials. Intelligence authorities in the Czech Republic say the two Russian agents who were recently expelled from the country last week were not primarily interested in the US missile defense shield. US spy community builds Wikipedia-style database. 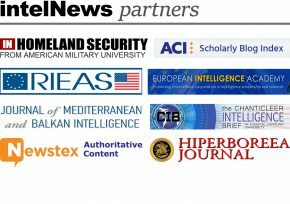 Intellipedia, the intelligence community’s version of Wikipedia has grown markedly since its formal launch in 2006. It now averages more than 15,000 edits per day and is home to 900,000 pages and 100,000 user accounts.